“Good timber does not grow with ease; the stronger the wind, the stronger the trees,” said a wise poet. For all gardeners, tree-caring offers joy and adventure. But it poses challenges at every nook and corner too. Trees’ growth comes at the cost of attentiveness and understanding plant’s requirements. Here’s what our experts have to say about tree maintenance. Add 3-4″ inch of organic content such as bark leaves or dry twigs. It helps retaining water and prevents weed accumulation. Also, it reduces erosion and facilitates root development.Water plants manually. Watering may be infrequent but should penetrate deeply. Except for Pines, all plants can be pruned in this season. Cut down the unwanted growth. Be careful and avoid cutting down the buds that eventually will grow for the next crop of flowers. Trim the branches appropriately before winter arrives. Heavy snow injures the branches and can prove fatal to the tree’s life, human and surrounding property. Prepare beforehand for any such mishap and do not ignore tree’s safety and nourishment in this season. Water the plants frequently and prevent it from any rodent’s influence. Make regular visits to inspect the tree’s well-beingness. Water the plants abundantly, especially if the plants are newly germinated. Give your trees a good source of water @10 gallons of water for each diameter inch of the tree. To ensure optimum temperature throughout the day, remember to water the plant once in the middle of the day.Remove the weak and broken branches. Bring your baby tree in proper shape. In case there’s a snowfall that hits before trees lose their leaves, shake your trees carefully. Prune the affected areas and minimize any insect invasion. Apply a wrapping around the tree to warm their structure. Wrapping ensures prevention of injury and damages that may harm the tree. Also, an optimally warm temperature encourages tissue growth thereby adding momentum to tree growth. Protection from rodents and insects: Let not your greener territory fall a victim of pests and intruding animals such as rabbits or mice. Make sure the garden is properly fenced and do pay regular visits to check for any inconsistency. Trust us, your trees love to see you visit them. They feel cared. “A tree that grows crooked will never straighten its trunk,” reveals the Chinese proverb. 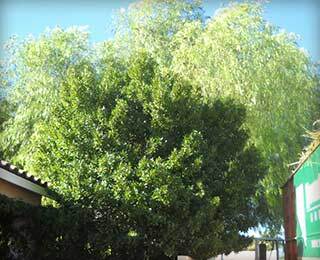 Let Nevada Tree Service take care of your trees. We focus in safeguarding your trees and have excelled since 1962 in tree maintenance. Having a personal rapport with every client, we understand your requirements perfectly. Please call or visit us here and assure your trees’ health, nourishment and in short vitality.